Chain gangs, although constitutional, were used in the 1920s to persecute people, mostly blacks, for their crimes. These “gangs” were groups of prisoners that were chained together to perform physically challenging work, such as building roads or mining. In 1865, the first set of Black Codes was passed in Mississippi. Black Codes were passed generally in the South, who pushed to find a way around the Thirteenth Amendment that declared the abolishment of slavery. The codes stated that if certain crimes were committed, they would be sentenced to punishment, some including chain gangs. The same concept was used in the 1920s when many southerners were trying to punish African-Americans in a way that was seen as constitutional. According to the Constitution, under the Thirteenth Amendment, involuntary servitude was legal, only if the individual was truly found guilty of the crime. It was strongly suspected, though never proven, that a majority of the blacks present in these gangs had even committed any real crime. 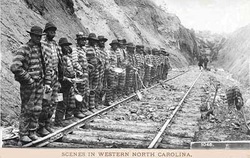 To southern black chain gang members, there was little difference between their own situation and slavery. Black members of the chain gangs became known as the “slaves of the state,” which completely contradicted the abolishment of slavery. Black prisoners wore chains around their ankles and were forced to sleep together with a chain between their legs that connected all of the prisoners together. This inhibited a man to use the bathroom during the night without waking each of the prisoners connected to the chain. This is how they received the title “chain gangs.” The Thirteenth Amendment also states that under involuntary servitude, a “master” must not cause serious harm or threaten it, physically restrain or threaten to or abuse any person. Work enforcement tactics, or punishments of chain gangs included beating with leathers straps, thumpings with rifle butts, the staking treatment: involved chaining a prisoner to stakes, and pouring molasses over his body while insects crawled all over him, the sweat box treatment, which was the practice of locking an inmate into a wooden box for days which was either tall enough to stand or wide enough to sit, and the Georgia rack, which was an act of stretching a prisoner between two hooks with a cable and a turn crank, that literally stretched the body. Chain gangs were able to pass as constitutional for years, until the depths of their investigations were proved otherwise in the 1960s. Slauther, Jennifer. "Chain Gangs." Online 1911 Encyclopedia Britannica. 2012. Web. 07 Feb. 2012. <http://encyclopedia.jrank.org/articles/pages/6045/Chain-Gangs.html>. "Thirteenth Amendment to the United States Constitution." Wikipedia, the Free Encyclopedia. Wikipedia, 4 Feb. 2012. Web. 07 Feb. 2012. <http://en.wikipedia.org/wiki/Thirteenth_Amendment_to_the_United_States_Constitution>. "Chain Gang." Wikipedia, the Free Encyclopedia. Wikipedia, 28 Jan. 2012. Web. 07 Feb. 2012. <http://en.wikipedia.org/wiki/Chain_gang>.